Microsoft has launched an online app called The H1N1 Swine Flu Response Center which helps you find out whether you have the symptoms of swine flu (H1N1 flu). This app is actually a Self Assessment test that helps you find out if you have the symptoms of swine flu and help you decide what to do next. This assessment test is based on material licensed from Emory University and is brought to you by Microsoft. 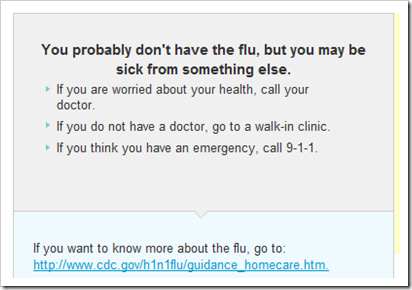 It helps you with the decision whether you should visit a doctor for H1N1 flu. 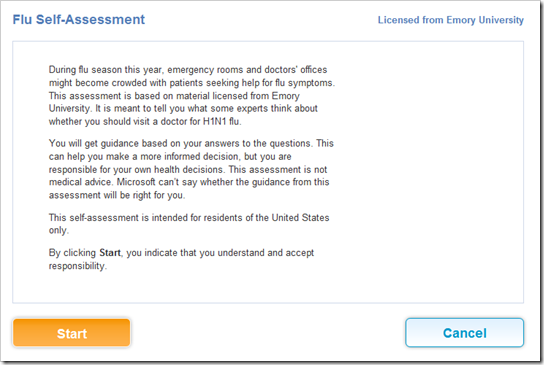 The self assessment test contains questions about your ZIP code, gender, age, how long you have been feeling sick, body temperature, etc. You will get guidance based on your answers to the questions which can help you make a more informed decision about your visit to a nearby hospital and Microsoft can’t guarantee whether the guidance from this assessment will be right for you. This self-assessment is intended for residents of the United States only. You might also like to know how RFID chips are finding their use in treatment of this deadly Swine Flu.